Inclusive sports for blind and partially sighted people often have an able-bodied equivalent such as Tennis and Blind Tennis. Generally they work on the same principles with a few adapted rules. 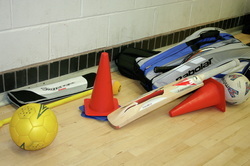 For certain activities adapted equipment is required such as audible balls or guide ropes (running). Arguably, the most important aspect of sport for the visually impaired is COMMUNICATION. Please select from the drop down menu for more specific details on certain sports and activities. Blind Football Development Sessions - These sessions are run in partnership with SAVI Northwest, Merseyside Disability Football Advisory Group, Liverpool County FA, Liverpool in the Community, The Everton Foundation and Merseyside Sport. Sessions are on Saturdays. Please call Greenbank Sports Academy for details (above).